Tony Castellano (Timpano) was born in Chicago to jazz musicians. 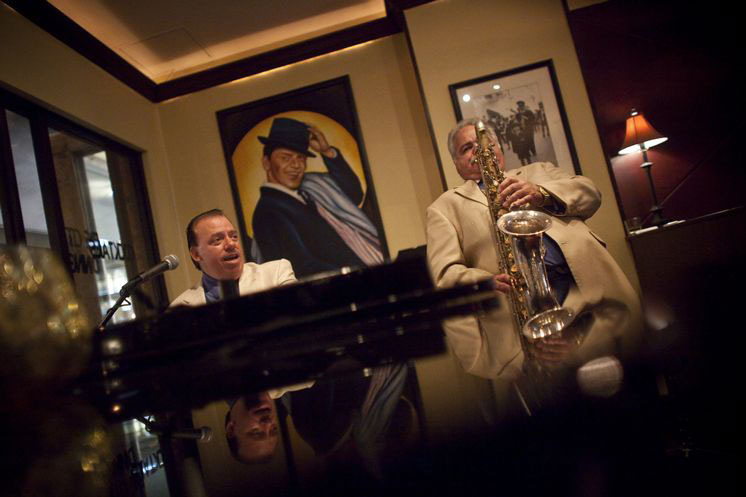 His father, pianist Tony Castellano Sr., had a trio in Miami; his mother was a singer. Tony Jr. started playing piano upon moving to Miami, Florida at the age of six; now he's older. For the past few years, he and tenor saxophonist Franco Marino (who used to play with Castellano's father) have been playing at Timpano restaurant in Hyde Park. A painting of Frank Sinatra hangs over the piano at Timpano, and you don't have to hang around long before hearing Castellano and Marino swing into Summer Wind or Nice 'n Easy or some other standard by the chairman of the board. Castellano is an old-school lounge pianist, with repertoire heavy on the songs of Sinatra, Tony Bennett and Mel Torme, but he can rock out, too, playing hits of Jerry Lee Lewis, Joe Cocker and Otis Redding. He once had a conversation with Billy Joel and remembers telling the piano man, "Billy, you've paid my rent the last 20 years."